We are a family of pasta-fanatics! I have my pantry full of different shapes and types of pasta. I would really love to make fresh pasta for my meals soon. I attended a fun pasta making class at Galeries Lafayette two years back, more on this here. Need to put the knowledge to some use! This makes an interesting lunch option on weekends. The pasta comes together in literally a couple of minutes. This is a go-to recipe even on week nights when after work, all I want is an indulgent bowl of warm pasta and griddled bread. I usually do my groceries from the Fruit & Vegetable market on Saturday afternoons. So making a fresh batch of pesto early on to use the fresh basil seems a good idea. 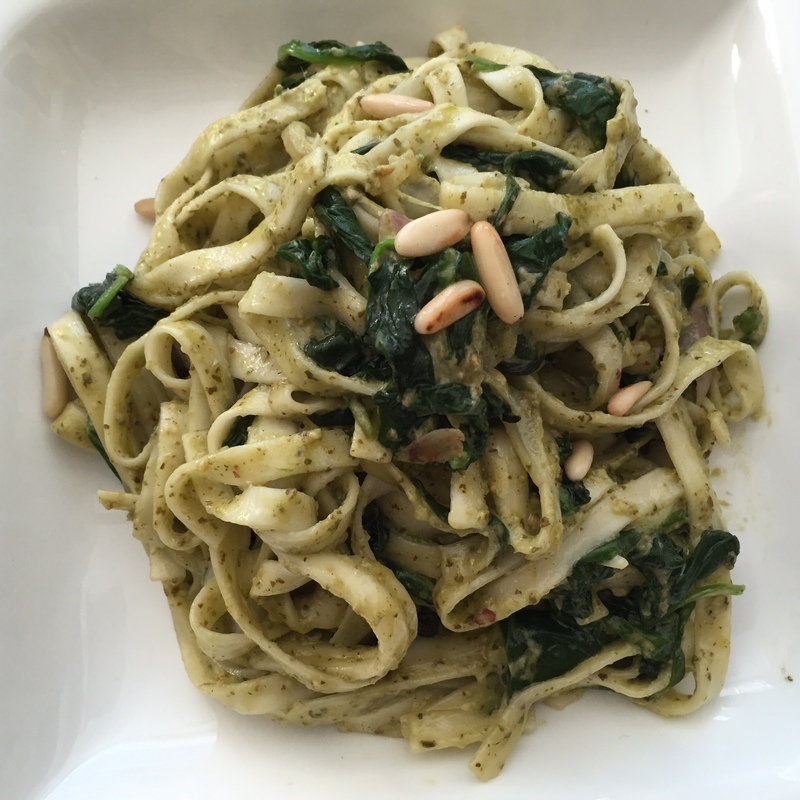 I readily use up the pesto within the first half of the week for this recipe. The pasta sauce is fragrant and oozes with flavours of basil, garlic, olive oil, sea salt, a handful of parmesan and pine nuts. I am not sharing the pesto recipe since I do not follow any standard measurements when making one. This is my husband’s favourite recipe as well. Some days I just toss the pasta in the sauce and top to with kalamata olives and sundried tomatoes and then there are times when I add some spinach to the mix. In a pan, heat some olive oil and add sliced onions. Cook with minced garlic until it is lightly browned. Add pesto and make a sauce with little water in which the pasta is getting cooked. Season as required, add garlic mayo to provide some more creaminess to the sauce. Go easy on the salt since the pesto already has salt from the parmesan cheese added to it. 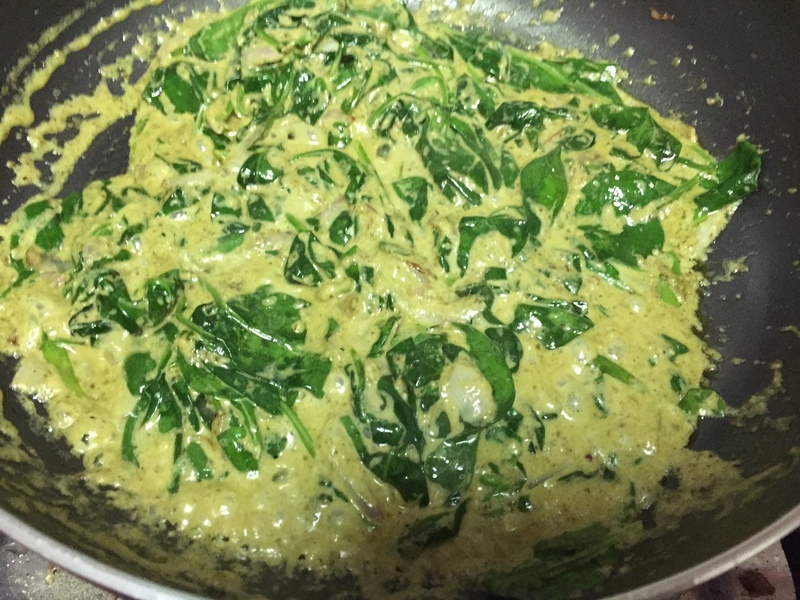 Add some spinach at this point and just sauté it gently. Cook the pasta, drain and add it to the sauce. Coat well and serve with a side of toasted baguette.